The Art of Being a Girl is a 1965 teen popularity and etiquette book by Judith Unger Scott. It's hard to find, and so much fun to look through! It really gives a glimpse of teen life in the 1960's. 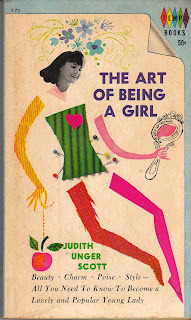 You'll find this book at Birdhouse Books: The Art of Being a Girl.